The essential point is that the Prime Minister, like President Bush before her, is genuinely trying to do her best, as she sees it, by the country in these unprecedented circumstances. Her efforts deserve the tolerance of our support, whatever our political allegiances. Normal political hostilities will resume over time, but, for now, the situation is one that should be above the partisan fray. Except that Bush took America to war, dragging many others in with it, and created a mess that is proving exceedingly difficult retract from. Extremism what ever it's source is always ugly and the extremist government of Afghanistan at that time encapsulated teh ugliness in all it's facets, but the cost of America's reaction is hard to bear. The challeng on JA is to react appropriately, and I have a great fear that the Government will overreact in some areas, at great cost, and won't do enough in others. The result will be more population control, eroding of freedoms, more division, more costs, and more anger and frustration. While you note the similarities of these respective leaders’ responses the two countries are of course at completely different ends of world power rankings. So if you give us the USA, a bloody nose, we will knock your head off in return. And they tried to, because they could. On the other hand, the power and effectiveness of passive resistance or defence is often overlooked. Because of out country’s circumstances, ie complete opposite to the USA, this is our given pathway. No chest beating, sabre rattling, just compassion and dignity. Our Prime Minister has acted accordingly and with quite some capability. 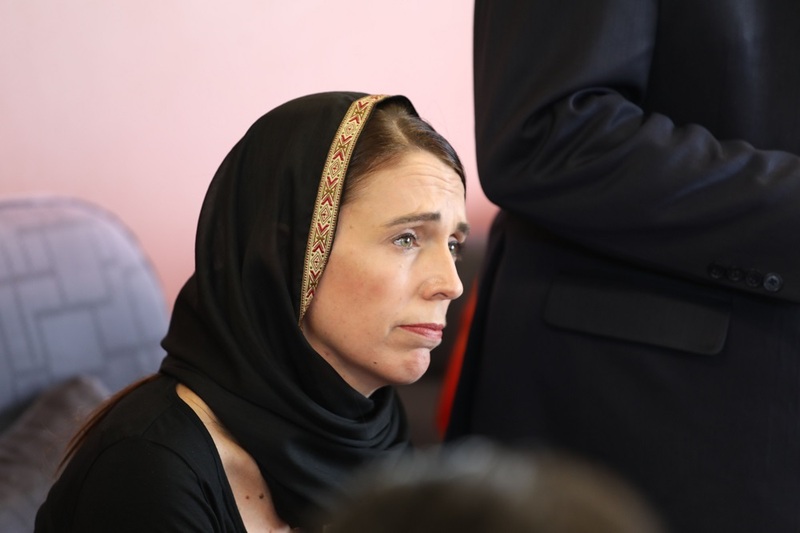 She is to be applauded and it makes perfect sense for NZ to put its major effort into putting its house in order, before anything else, to ascertain where we have gone wrong and install as many safeguards as possible to avert any reoccurrence. Bush's clumsy actions are easy to criticise but consider what the world might look like had the USA not engaged with militant Islamism. The second Gulf War didn't turn out very well. It was to the benefit of a few, but caused the deaths of millions. Macadder. 460,000 is the generally accepted number. When you say it was 'to the benefit of the few' are you referring to the 50,000 Iraqis who were dying horrid deaths at Saddams hands each year that now are not? Too late for the hundreds of thousands of murdered bodies currently being exhumed, the thousands gassed in his Halabja gas attack, countless victims of his crushing of the Shia revolt and marsh Arab extinctions and I million deaths from his war against Iran. Iraq is still in a terrible state but for the first time in decades the country has some hope and the region is rid of one of history's monsters. Mr Dunne writes the Prime Minister is genuinely trying to her best. Well she is succeeding in the opinion of everyone I have spoken to. I have always thought Andrew Little would be a better prime minister (not a view commonly shared but he has more experience of work in the real world) but I cannot imagine him being so effective at expressing the grief and determinaion of NZ. My wife says it is because she is a woman - please pardon my sexist agreement. Your wife is very smart, and don't be afraid to tell her. i agree with her, i cannot see a bloke being able to communicate and act in the way that JA has in this event. I hope and believe that this event and JAs leadership in response to it has been cathartic for NZ, and it will be ironic that such an act of hate will draw us into a more open, accepting and respectful community and country. I have considered the language of greetings; in english we say "Hello", which does not mean much at all. In Te Reo we often say "Kia Ora" which wishes good health. But Islam greets people with "As salamu alaykum" or Peace be upon you, and is responded to "wa alaykumu salam". the wishing peace is the highest form, as good health will come from being at peace. In Te Reo this would be "Kia tau te rangimarie" and can be responded in kind. This is the challenge, however you greet people in what ever language wish them peace. In Vulcan *symbol goes into error* "live long and prosper"
Much as I applaud the Prime Ministers leadership since last Friday I'm actually a little confused about the current governments position on terrorism. This week we appealed for global cooperation but at the start of the month declined to seek the extradition of a New Zealander who joined ISIS and was now in Kurdish custody. If we are going to be a proactive force for good, which I hope we are, we need to make sure our decisions align with our stated goal. Killing innocent people, no matter who they are, is an atrocity, period. However, underneath this ugly wound, there have been decades of lack of discussion, deliberate ignorance and even cover-ups on issues around refugee, religion, crash of civilization, fairness, equal treatment, mutual respect, and extreme political correctness in all western democratic countries, which could be the causes. And Ardern has already started to shut down the debate. Her 'give him no name' speech sounds like it was written by George R Martin (no one) and JK Rowling (the name that must not be spoken). Remember the name Hitler - Lest we Forget. I think you are wrong to claim the PM is trying to shut down the debate. What debate? The most heinous act of terrorism was committed resulting in 50 deaths and many other people being seriously injured. The PM is trying to keep the focus on the victims, not on the perpetrator. We all know the name of the alleged perpetrator. And we will hear much more about him when he goes to trial. So why can't we just focus on the victims of his terrorism for now. GV. I agree there is little evidence the PM is seeking to shut down the debate but I'm conflicted over whether naming (or not) is the best approach. I share Ardern's distaste at speaking his name but wonder if she has given enough weight to the human need for details and facts when attempting to come to grips with tragedy. Aussie papers published not only his name but also unpixellated photos of his face, which for me helped provide context. I'm not convinced that reducing him to an amorphous entity is the best approach. Dunnes piece is about the 'Ides of March. ', ie already pointing forwards the future, hardly just a focus on the victims piece. And the debate is being shut down, there is no debate about changing the gun laws, that's what Govt.s do in times of emergency. The irony being that when we did debate it, the recommendations were ignored. Our Version 1 Beware the Ides of March moment end date was last Friday as at least as far back as 1997 it was recommended that these types of weapons be banned or heavily restricted, AND terrorism experts warned us that there was a very high likely hood of an event like this happening if we did not make these changes. Our Prime Ministers response is amazing, but remember this whole tragedy was not an accident and as Xingmowing highlights this has been decades (predictably) in the making. Agreed Dale. this is a point that I have been trying to make. The Government and authorities overreact and don't do enough at the same time. The debate is far too superficial and too much is not being talked about. Disagree that the refusing to use the name is about shutting down the debate. Much like denying the perpetrator tv and news access, it's about refusing to reward the person with the notoriety their narcissism drives them to seek. The drivers of this sort of action are up for discussion, but that is different from rewarding the narcissism of the actors. Political correctness, whatever that means; and I take it as showing respect and tolerance for other views, religions and cultures; isn't the problem here. Tolerance doesn't exclude the rejection of intolerance. The evil of extremism comes dressed in different ways, whether ISIS or white nationalism is forged the same way by fear and hatred. What has happened in the West after 9/11 is that there has been a singular focus on Islamic extremism, that has marginalised moderate and progressive Muslims, as well as neglecting the fact that the great majority of its victims internationally are Muslim. The rise of fascist and white nationalists internationally has gone under the radar until now. It has coincided with the rise in authoritarian and populist governments worldwide and it is no coincidence white nationalists take inspiration and are invigorated by the current president of the United States and the Republican administration. The Australian ALP for years also played the immigration and islamophobe card for populist and racist votes, coupled with the Murdoch racist press, weaponised by Facebook and 8chan................it reached its inevitably murderous conclusion in Christchurch. Fascisn abd white nationalism under the radar? Haven't you heard of ""The Oklahoma City bombing was a domestic terrorist truck bombing on the Alfred P. Murrah Federal Building in downtown Oklahoma City, Oklahoma, United States on April 19, 1995. Wikipedia Date: 19 April 19.95 Number of deaths: 168""
""Anders Behring Breivik is a Norwegian far-right terrorist who committed the 2011 Norway attacks. On 22 July 2011, he killed eight people by detonating a van bomb amid Regjeringskvartalet in Oslo, then shot dead 69 participants of a Workers' Youth League (AUF) summer camp on the island of Utøya."" There have also been many reports in our media of swastikas painted on Jewish graves in many western countries. And yet until now, the great majority of Westerners would have pointed to the Middle East, if asked as to the main source of terrorists. The same with the mainstream media; you will recall a few weeks ago the endless speculations about the British, but stateless 19 year old ISIS pregnant widow and our own "bumbling" Kiwi jehadi Mark Taylor. And, this week if appears now, that our own intelligence services and those internationally, have for years neglected white extremist surveillance. but I don't like the look or the thought of armed police in NZ having to and being so visible guarding schools as an ongoing practice. You soon cease to notice it when spending time in the many other countries around the world where cops openly carry weapons. The same global political and religious clashes that forced those other countries to arm their police have now arrived in sleepy NZ. Banning MSSA centre fire weapons must now happen but that won't remove the need for our cops to publicly carry guns more often. I can’t agree with you Dale Smith. A person’s name is a form of advertising. It is each person’s brand. Apparently many terrorists want to be rememembered. So, in my view, it is appropriate to deny them that. We should remember the event but not the person who perpetrated the crime. Hardly good or fair on brand Australia. I see online NZers apologizing overseas in Muslim countries for being NZers, many are doing it out of fear of retaliation. Most of the victims where Kiwi's. If you take away his name, you only push the perceived responsibility onto others. He may have others that share his ideology, but this act was carried out by one person, and we know his name. "Hardly good or fair on brand Australia" why? In comparison Australian politics is xenophobic and racist. Look at the very laws around people from NZ. They treat us worse than any other immigrant group. It is hardly a surprise that an Australian would be the perpetrator of such a crime here. To [correctly] identify him as Australian, and a recent arrival, may give the Australian politicians (and others) pause about the messages they put out. Because from that the next default categorizes are being white, and then male. which then gives those with a grievance (both real and imagined) more to blame as responsible and thus more retaliatory targets. But we could also throw in the city and country it happened in as been guilty by proximity. And here is the whole absurdity of Ardern's 'no name' speech. If she really wanted not to have his name remembered, she would just not say it, rather than saying she wasn't going to say it. The fact of highlighting she was not going to say it, only highlights his name more. Now everyone listening is going to be checking her speech, or anything coming from her dept/Govt. to see if they accidentally say it. Media might even try and trick her into saying it. And to know whether she did say it or not, means you have to know his name. Also whatever proxy she chooses instead in reference of his real name will highlight who he is, eg, Who is 'The Butcher of Bagdad'? I'm sure we could come up with some great alliterations. No, I still believe you are wrong Dale Smith. Any use of an adjective is designed to affect the readers perception. That is the aim of the writer. And what adjective are you referring to? The pollies on both sides have closed ranks on our gun laws. Bennett is defending her arms law review decisions as police minister and Ardern is trying to explain the decision of a recent committee she chaired which decided to allow people to buy MSSA's without personally visiting a police station. Bennett is batting away criticism with accusations of hindsight and Ardern is distancing herself through a spokesperson. Both must at some stage in the near future personally front up and properly explain why they rejected the credible submissions that rules for MSSA's needed to be tightened.